On April 1-3, three priests from St. John the Baptist Cathedral in Washington, DC – Archpriest David Pratt, Priest Alexander Resnikoff, and Priest Damian Dantinne – took part in the annual Great Lenten Retreat for clergy of the Eastern American Diocese, held at St. Alexander Nevsky Diocesan Cathedral in Howell, NJ. 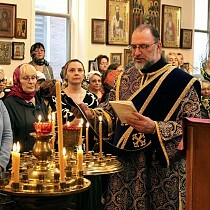 Cathedral rector Archpriest Victor Potapov could not take part, in light of difficulties with his heart. Upon completion of the Retreat, the clerics, enriched by their interaction with their brother clergy from across the Eastern American Diocese, headed for home, taking with them the myrrh-streaming Icon of the Mother of God "Softener of Evil Hearts," currently visiting from Moscow, accompanied by her guardian, Sergey Fomin. On their way to Washington, they visited Holy Transfiguration Church in Baltimore, MD, where the parishioners eagerly awaited the holy icon’s arrival. In the Baltimore church, the priests – joined by parish rector Archpriest Ion Barbus – served a moleben and akathist, and shared in a bountiful Moldovan meal organized by the Holy Transfiguration parish sisterhood. The following day, Thursday, April 4, the myrrh-streaming icon visited the very ill handmaid of God Irene at a hospital in Washington, and was then triumphally taken to St. Herman of Alaska Church in Stafford, VA. Here, His Eminence, Metropolitan Jonah (former Primate of the Orthodox Church in America and parish rector) served the appointed moleben and akathist to the Most Holy Theotokos. On Friday, April 5, the icon visited several more sick parishioners, and that evening was brought to Holy Apostles Church in Beltsville, MD. 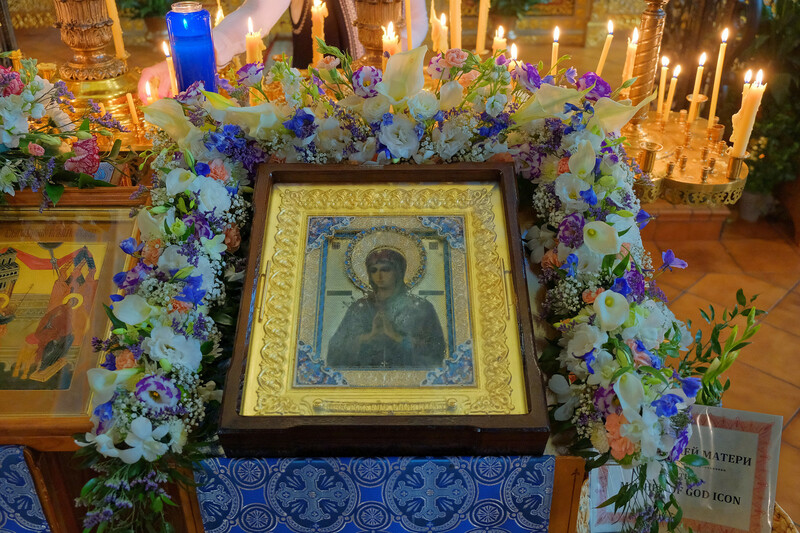 The following two days (March 6-7), the great feast of the Annunciation of the Most Holy Theotokos, the myrrh-streaming image was present at St. John the Baptist Cathedral for all of the Great Lenten services. Between services, the icon visited more ailing parishioners. 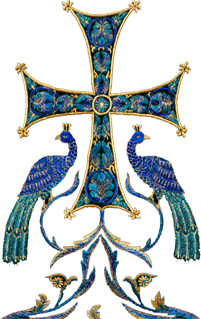 On Sunday morning at Divine Liturgy, with the blessing of His Eminence, Metropolitan Hilarion, new parish cleric Archpriest David Pratt was awarded the jeweled cross at the Little Entrance, for his dedicated 27 years of service to Christ’s Church. A great number of people were communed from five chalices. As always, Bishop Nicholas, delivered a thoughtful sermon, this day dedicated to the feast of the Annunciation of the Most Holy Theotokos. His Grace added to this theme several words on Venerable John of the Ladder (Climacus) and the Holy Hierarch Patriarch Tikhon of Moscow, whose memories this year coincided with the feast of the Annunciation. His Grace preached in two languages. 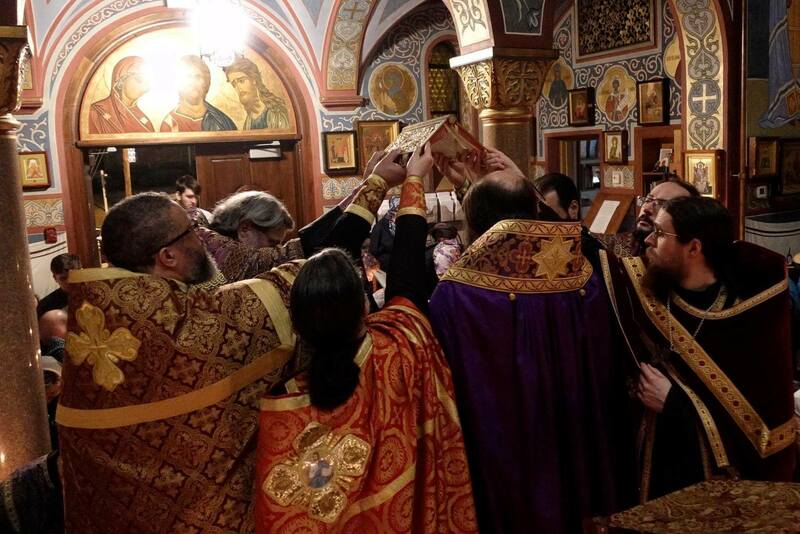 After Liturgy, Orthodox Washingtonians stayed to pray for a long time before the myrrh-streaming image. They were also anointed with holy myrrh and received a small copy of the icon. At the same time, a luncheon was offered in the parish hall, organized by the Holy Virgin Protection sisterhood. That Sunday evening, the Sacrament of Holy Unction was performed, led by His Grace, who was joined by six priests and three deacons. Hundreds of people were able to receive the grace of this Holy Sacrament. The following day, the icon visited two more parishioners in the hospital. After this, it was received by the two monks from Holy Cross Monastery, who departed with the icon’s guardian Sergey Fomin for the habitation in West Virginia. Thus concluded the 11th annual visitation of the wonderworking icon of the Mother of God "Softener of Evil Hearts" to the American capital.